The University will be hosting the New York City Career Fair on Tuesday, May 22, from 2-5 p.m. at Lubin House in Manhattan. 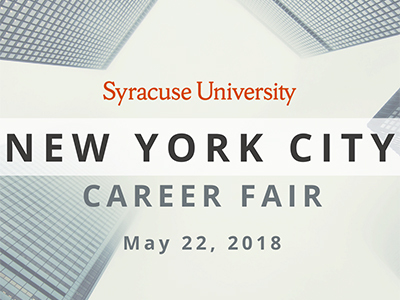 This event provides Syracuse University students and recent graduates a chance to meet directly with employers based in the metro area looking to fill positions in New York City. This event is open to all current SU students and recent graduates, regardless of major or class level. Employers attending the career fair will be on hand to discuss internship and job opportunities as well as provide information on company culture, recruitment processes and the type of applicant that fits well with their company. Students will need to bring several copies of their resume and wear professional dress to the career fair. Researching attending employers prior to the fair is also greatly encouraged. A complete listing of employers attending the New York City Career Fair can be found at orangelink.syr.edu. There is no cost to attend the fair. All students and recent graduates looking to attend the fair are asked to RSVP at orangelink.syr.edu. For questions about the event, students are encouraged to visit Career Services in 235 Schine or call 315.443.3616.